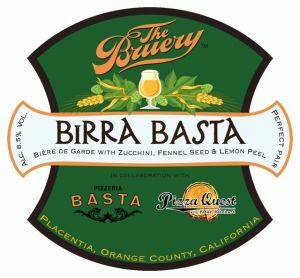 I mentioned in a previous post that Peter Reinhart and Pizza Quest have been working on a cool project with The Bruery. While doing a segment with Kelly Whitaker of Pizzeria Basta, in Boulder, CO, the Pizza Quest crew were turned onto The Bruery's unique and different beer. One of the Pizza Quest producers, Brad English, lives near The Bruery and started talking with Patrick Rue. Those conversations resulted in a challenge nicknamed The Big Reveal. The basic premise was to reverse the typical beer and food pairing, where food is prepared to match a given beer. 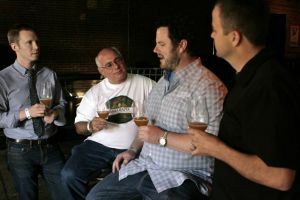 Instead, Kelly Whitaker and the Pizza Quest crew challenged The Bruery to design and produce a beer based on a special pizza that they created. The caveat being that the challenge pizza would involve some unique and different ingredients, which matches well with The Bruery's brewing philosophy. The pizza crust was built on Italian double zero flour, pumpernickel rye flour, and crushed amber crystal malt, which pulls in the beer theme even more. The pizza was topped with fresh burrata cheese (a blend of fresh mozzarella wrapped around creme fraiche), sweet white sardines, preserved lemon, squash blossoms, fresh arugula sprouts, and fennel salt. In response, The Bruery created a biere de garde style ale called Birra Basta. The malt base included pilsner, six-row, munich, biscuit, amber, and aromatic malts. It was hoped with Columbus and Strisselspalt hops. To match the pizza, Birra Basta included a variety of other spices and ingredients, including roasted zucchini, fennel seeds, lemon peel, and Spanish cedar. The zucchini, perhaps the most interesting ingredient, was used in the mash, while the other ingredients were added to the fermenter. "But here's how I experienced the flavors when I had them all together: they worked! What I mean, and I'll try to describe this without hyperbole or fake gastronomic melodrama, the beer really did change, and so did the pizza, when we had them together. The best way I can describe it is that they both took on a new degree of depth, as if the flavors of one filled in the blanks of the other and a wholly new level of completeness revealed itself." What an excellent idea and one that we can hope will be carried out further. Being homebrewers, we have an even greater ability to design beers to go with specific foods or meals because of our smaller batch sizes. Give something like that a try and let us know how it turns out. Life After "The Big Reveal"
Poll: What's Your Favorite German Lager?